The community-driven Revealing Queer exhibit surveyed how the Puget Sound lesbian, gay, bisexual, transgender, and queer (LGBTQ) community has grown, changed, become more visible, and worked towards equality. 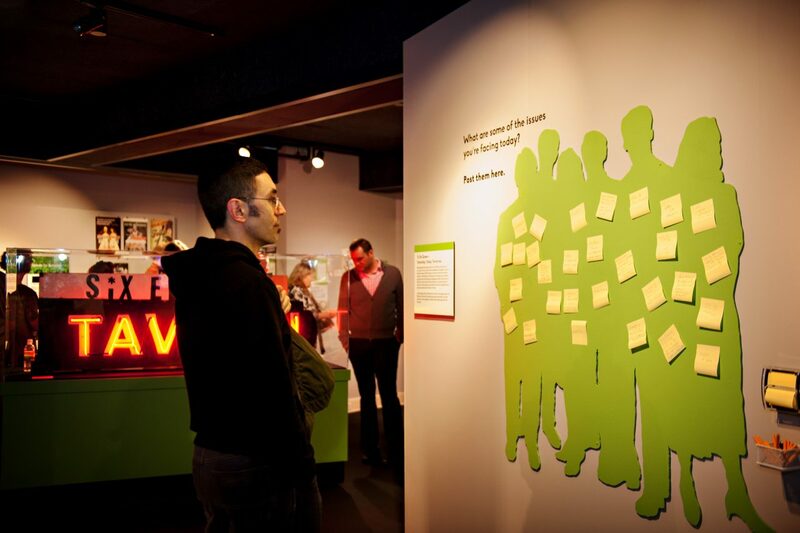 Informed throughout by the experiences of this incredibly diverse population, the exhibit traced LGBTQ history from an emerging underground group in the years before the Stonewall Riots of 1969, to the large and politically active community that helped make marriage equality law in Washington State in 2012. Visitors discovered this complex history through a variety of themes, including language, significant cultural spaces, queer celebrations, regional law, and more. The artifacts, photographs, and documents that filled the exhibit came both from MOHAI’s collection and from donors across the country—many had not been seen before by the public. This exhibit was the result of collaboration between many individuals and organizations, led by Erin Bailey and Nicole Robert, co-founders of Queering the Museum—an ongoing project to uncover and share LGBTQ stories in institutions across the country. Bailey and Robert worked closely with a Community Advisory Committee composed of representatives from local LGBTQ organizations to create Revealing Queer. Researchers have found lesbian, gay, and bisexual high school students are more than twice as likely to have attempted suicide when compared with their straight peers. In 2010, Seattleites Dan Savage and Terry Miller created the It Gets Better Project to provide support to LGBTQ youth, helping them make it through the hardships they face during high school. Visitors were given the chance to share and start a dialogue in Revealing Queer. Pride is an annual reminder of the struggles of early LGBTQ activists, a protest against continuing injustices and a celebration of our achievements. 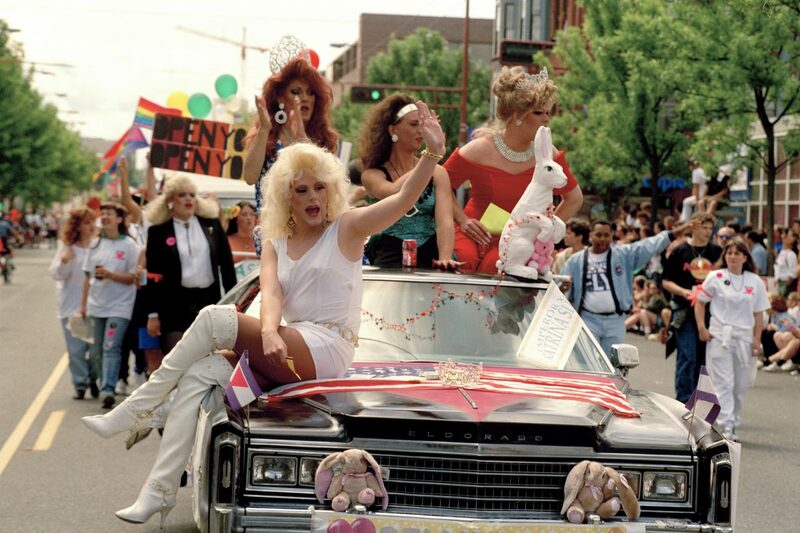 Seattle’s first Pride celebration took place in Pioneer Square in 1973, when about 200 people celebrated the anniversary of the Stonewall riots. In 1974, Seattle Gay Community Center organized the first parade in downtown Seattle, ushering in a new era of gay visibility. Gay Pride Week was formally recognized by the City of Seattle in 1977. This photo was taken at the 20th Pride parade in 1993. Gay bars are critically important to LGBTQ communities. In Seattle, many gay bars became de facto community centers. MacIver Wells and John Chadwick opened the 611 in 1962 at 611 2nd Ave. and served a gay clientele. The 611 remained in business for over 40 years and held a number of parties, meetings and fundraisers. Queer spaces have always existed throughout Puget Sound, sometimes in public, sometimes in private. These were places where the LGBTQ community could socialize, get support, and find other people with common interests. Shelly’s Leg opened in 1973 and quickly became a popular bar for LGBTQ people and their guests. Co-owner Shelly Bauman named the bar for the leg she lost to a misfired cannon in a Pioneer Square parade. Money from the lawsuit helped her start the bar. Shelly’s was open to both gay patrons and their guests, offering a space that merged the gay and straight communities. This iconic sign is on display in True Northwest: The Seattle Journey. A variety of terms are used in LGBTQ communities to communicate people’s complex and (ever-changing) experiences and identities. 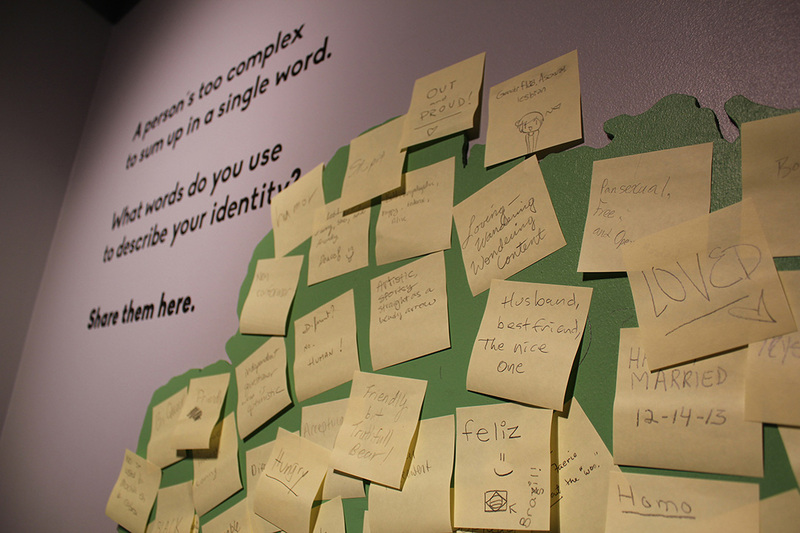 In a community conversation board, visitors were asked to share words that they felt described their identities. A panel of Seattle artists discuss their experiences as queer trans people of color (QTPOC) and the representation and visibility of QTPOC in media, history, activism, and the art world. The discussion was moderated by DJ SassyBlack of Cat of THEESatisfaction. Panelists included RC Brown, artist/musician/DJ, activist, and community organizer; Storme Webber, a Two-Spirit, Aleut/Black/Choctaw writer, interdisciplinary artist, curator, educator, and cultural producer; and Lulu Luzviminda Uzuri Carpenter (aka Lulu), a cultural worker and producer. 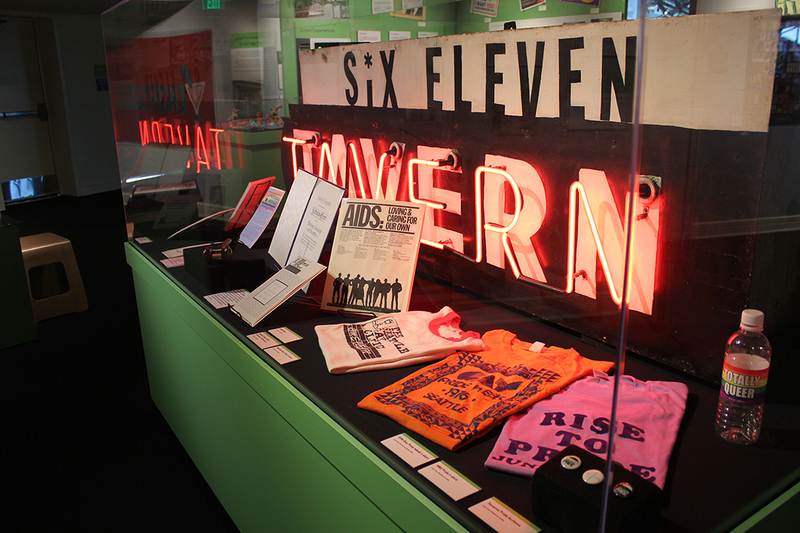 In February 2015, History Cafe explored LGBTQ history during discussion about the impact of HIV/AIDS in Seattle. Panelists included Phil Bereano, Community activist and co-founder of ACT UP Seattle; Christine Hurley, Former Executive Director at Bailey-Boushay House; Dr. Robert Wood, Former Director of the HIV/AIDS Program at Public Health, Seattle & King County; and was moderated by Erin Bailey, curator of Revealing Queer and Co-founder of the Queering the Museum Project. The Queering the Museum Project Facilitates dialogue between community members and museum practitioners. The Queering the Museum (QTM) Project is an ongoing coordinated intervention into representations of LGBTQ people in museums, and addresses the role that museums play in forming social norms around gender and sexuality. QTM aims to facilitate critical dialogues between community members and museum practitioners, addressing the role that museums play in forming social norms around gender and sexuality. Revealing Queer was co-curated by Erin Bailey and Nicole Robert, founders of the Queering the Museum Project. 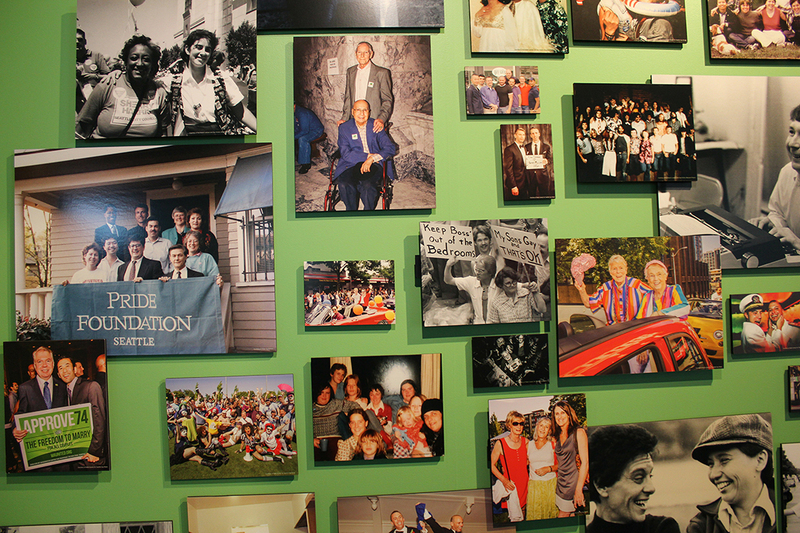 This exhibit is the result of collaboration between many individuals and organizations.